New Delhi, India -- With China upping the ante over the Dalai Lama issue, President Pratibha Patil and Prime Minister Manmohan Singh skipped the four-day Global Buddhist Conference that began on Sunday with the chanting of prayers to mark the 2,600th year of Buddha's enlightenment. 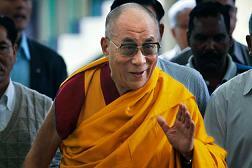 << The four-day Buddhist meet to be attended by the Dalai Lama started on Sunday in New Delhi. Patil, who was invited by Asoka Mission, the organisers, to inaugurate the conference, opted out of it as China strongly objected to the Dalai Lama's valedictory address at the conference Nov 30. A week ago, the president's office called the organisers to tell them it may not be possible for her to attend the function, a well-placed source told IANS. Prime Minister Manmohan Singh, too, was invited by Asoka Mission as guest of honour, but is understood to stayed away due to Chinese sensitivities. Instead Sikkim Governor Balmiki Prasad Singh presided over the function and Karan Singh, an eminent scholar and president of the Indian Council for Cultural Relations (ICCR), was guest of honour at the conference. Around 1,000 Buddhist scholars, thinkers and followers from over 30 countries assembled at convention hall in Ashoka Hotel on day one of the conference. A 40-strong contingent of Chinese scholars was expected, but with Beijing taking objection to the Dalai Lama's valedictory address, only 7-8 Chinese Buddhist scholars have managed to come, Ashok K. Wangdi, a member of the organizing committee of the conference, told IANS. Despite Chinese objections, India has refused to cave in. The Dalai Lama, the exiled Tibetan spiritual leader who made India his home over five decades ago, will come to Delhi Nov 30 for the valedictitory address. When India conveyed to China its oft-reiterated position that the Dalai Lama was a spiritual leader and an honored guest and was, therefore, free to speak on spiritual matters, Beijing hardened its stand and is said to have demanded the cancellation of the conference. India, however, stuck to its position, leading to the postponement of boundary talks between special representatives of the two countries in New Delhi which coincided with the Buddhist conference. "It's unfortunate, this attempt to give a political colour to a religious functio”," said Tempa Tsering, Dalai Lama's chief representative in New Delhi. The Asoka Mission has strongly objected to the politicization of the event. "The overriding theme of the conference is to commemorate the 2,600th year of Buddha's enlightenment. The conference aims at evolving a collective Buddhist response to pressing global challenges like climate change, violence and pressures of modern living," said Wangdi. "It is first and foremost a religious event. We are very upset by China's attempt to politcise it," he said.